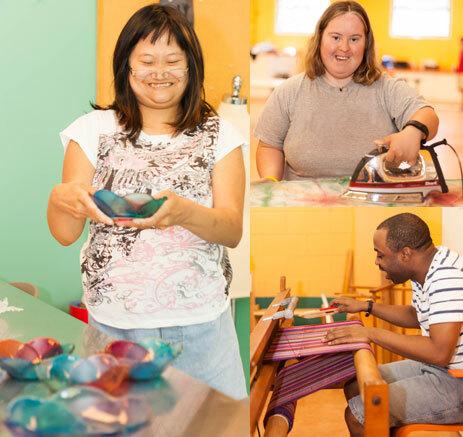 Coletta Collections is run by St. Coletta of Greater Washington, a nonsectarian, nonprofit organization that serves children and adults with intellectual and multiple disabilities in the Washington, DC area. All of the items on this site are handmade in the USA by participants in one of our programs. Coletta Collections also has retail stores that offer a variety of crafts such as fused glass tableware, jewelry and hand woven table linen and accessories made by our participants. In addition to being a point of pride to be able to sell what they make, the shops offer our participants the opportunity to learn retail skills and have daily community integration. A limited number of our products are available through this website. At St. Coletta we believe in the right of each individual to live as full and independent a life as possible. We respect the dignity of all persons entrusted to our care and our goal is to serve them in an atmosphere that encourages their talents, celebrates their successes and builds their self esteem. Your purchase helps continue to see possibilities beyond disabilities.